Sydneyâ€™s Canadian sister has much to recommend it, even if Wallabies give way to Caribou and Dingoes to Wolves. The fabulous harbour, agricultural hinterland, and vast wilderness beyond beg to be explored. In 1840, two cities called Victoria were founded, in honour of the new Queen. One was the principal settlement in Hong Kong, the other a foot-hold on the west coast of Canada. Victoria, on Vancouver Island, is still the capital of British Colombia, but is now dwarfed physically and financially by Vancouver itself, a 40-minute sea-plane flight away, harbour centre to harbour centre. Vancouver is named after a young man who sailed with Cook to the Pacific and later became a noted naval surveyor in his own right, exploring from Oregon to Alaska in the late 1790s. Vancouver has one of the world’s great natural harbours, and its success was assured when both rival trans-continental railway lines decided to terminate their services there. A jumping-off point for the interior, the gold rush briefly swelled Vancouver’s population as men poured in to the Fraser Valley and its alluvial goldbearing gravel, and headed up every tributary looking for the ore-source. The whole territory of British Colombia was explored very rapidly as the prospectors swarmed everywhere in their hunt for gold. The real gold, as ever, was made by those who followed along behind, selling food and tools and services to the people in the wilderness. Whole towns were born, and died, within a decade. Towns like Barkerville that have somehow survived the complete removal of their populations, and yet the buildings and some of their contents stand, now carefully preserved. The Chinese Apothecary’s hill-side medicinal herb garden still boasts the plants he grew to treat his fellow-Chinese. Six hours hard driving from Vancouver today, Barkerville was two or three months hard walking then. Once the biggest city west of Chicago, by 1872 it was all but dead. Almost all of British Colombia is as it was in 1840. 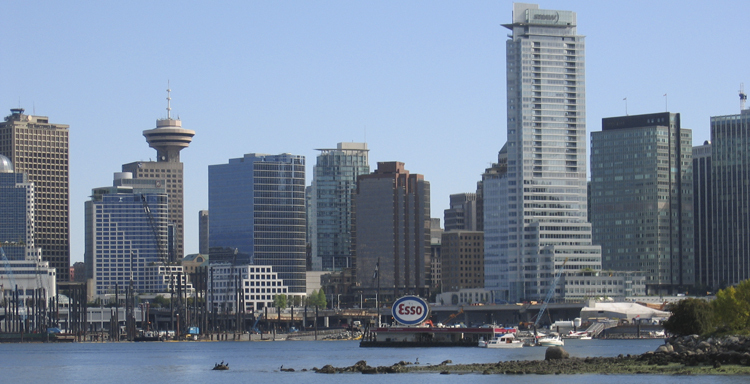 Population for the entire province is 4.1 million, and 2.2 million of these live in the Vancouver conurbation. Most of the rest live in the south of the province, in a small string of towns close to the US border. This is true of Canada in general. There isn’t much in the interior. Except nature. Huge tracts of temperate rainforest, mile after mile of it, and despite evidence of logging activity, there is more evidence of planting activity. It is very much in the loggers’ interests to replenish the forests, and criticism of their activity is focussed on the localised impact on other life in the environment. Salmon streams, rare birds and plants can all be damaged if the logging companies aren’t careful. BC is a little larger than New South Wales, and it is all wet, barring a tiny patch of dry country in the far south hidden in the rain-shadow of the Cascades, the coastal foothills of the Rockies. It is generally fertile, and farming and ranching are important, as are mining and logging. And it is beautiful. Vancouver is one of the nicest cities to live in the world, and the huge delta of the Fraser Valley is some of the most fertile land in the world. The wilderness starts right at the edge of town, and people who live in outlying settlements of Vancouver have to have extra-strong garbage bins, so as not to encourage the bears. It is not unusual, even in downtown Vancouver, thanks to the colossal Stanley Park, a couple of square miles of forest in the centre of town, to see raccoons and skunks parading across the road. Everyone stops for the skunks.